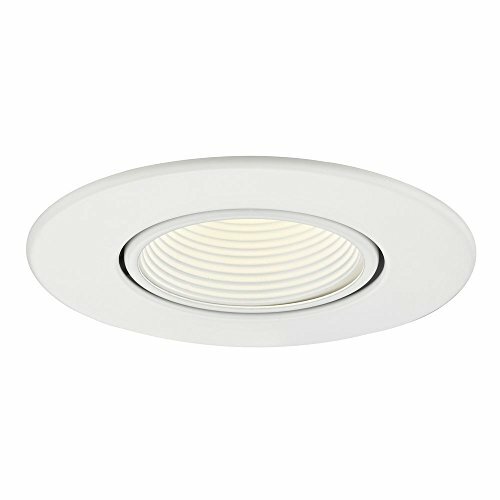 GU10 Adjustable Recessed Trim with White Baffle for 3.5-Inch Recessed Cans This small aperture adjustable white baffle trim with the proper GU10 LED bulb is a wonderful choice for lighting kitchens, living rooms, family rooms, bedrooms, hall ways and dining rooms. With the powerful combination of LED GU10 MR-16 bulbs capable of light output up to 65 watts of light. The small aperture eliminates the need for large holes in the ceiling that standard recessed lights create, yet provide plenty of light when installed in ceilings up to 10 foot in height. This trim can be used with the corresponding 3.5-inch recessed housing can lights, IC or non-IC rated. Suitable for installation in dry and damp locations. 120 volts line voltage. UL / CUL certified. 2.25 in x 4.5 in. Recesso Lighting By Dolan Designs Gu10 Adjustable Recessed Trim w/ White Baffle For 3.5-Inch Recessed Cans - Steel Ceiling Light Fixture.